OK, so Marvel just shilled out however many millions of dollars to the Jack Kirby estate, most likely to keep labor issues related to that long-running dispute far, far away from the US Supreme Court. Therefore, it's clear that the company's famous thriftiness has limits. But does that mean it has suddenly decided to spend money like Michael Carroll? Almost certainly not, even if the rumor making the rounds that says otherwise is far too interesting to ignore. Remember when Marvel announced a mysterious movie for May 3rd 2019? Well, many thought that Avengers 3 will come four years after Age of Ultron, only to be rectified by Marvel studios president, Kevin Feige who hinted that the threequel will be released, as previously thought, in 2018, three years after Age of Ultron. Few days later the studio locked the May 4th of that same year for another untitled movie. According to our source, Marvel studios is considering the option (as of last year but have now made a decision) of having Earth's mightiest heroes begin the battle in Avengers 3, coming out May 2018, only to be concluded in an untitled May 3rd 2019 movie. According to this report, the exact plan isn't decided on, but it will involve one of two options. Option one would see Avengers 3 turned into a two part film, Hunger Games/Harry Potter style. 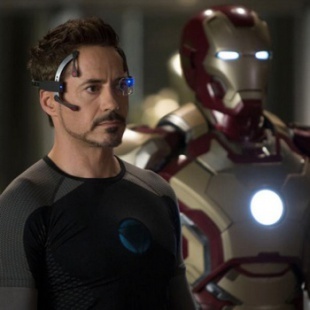 Option two would have the first half of the story in Avengers 3, and the conclusion occur in a separate film not specific to the Avengers. Either way, the result would, supposedly, be a mega-crossover bringing together multiple franchises in order to deal with Thanos and his quest for the Infinity Gauntlet. Of course, it wouldn't be a hot rumor about the Marvel Cinematic Universe without Vin Diesel managing to fan the flames. And so it is that this rumor gets a twofer, thanks to comments made by the Fast and Furious star in 2013 and earlier this year. When he was still doling out cryptic hints about his involvement in the Marvel Cinematic Universe, Vin Diesel suggested something huge in an interview with Maria Menounos. "When I met with Marvel it wasn't for anything immediate, it was to talk about a film that would be introduced in the Phase 3 part of Marvel, not for a few years," Diesel said. "I get the call, I go down to Marvel. A great meeting. It was even talking about something so big I can't even talk about because it's like the merging of brands in a way, which I won't get into. That was something way, way, way, way, way down the road." Fast forward to the staggering success of Guardians of the Galaxy. On August 9, Diesel took to his Facebook page with the following tease: "Vin and Marvel... you all made it happen! I get the strange feeling that Marvel thinks I'm Inhuman... Haha." What did he mean? Well, three days after Vin made that comment, rumors broke that an Inhumans movie is in development. 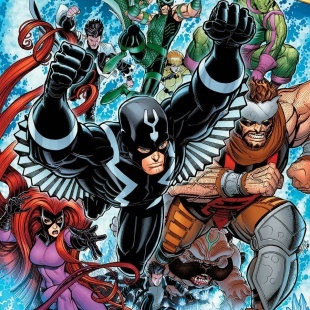 The Inhumans are, of course, widely understood to be Marvel's antidote to Fox's ownership of the film rights to X-Men and all related characters. A secret, hidden race of people descended from early humans, they were subjected to experiments by the Kree empire hundreds of thousands of years in the past. In the present, they are all born with fantastic powers and given their often frightening appearances, they can easily fit the slot designated for "persecuted minority superheroes." In short, they're mutants that spare Marvel from having to utter the "m" word*. It's not exactly a state secret that Marvel intends for the Inhumans to be a huge franchise of their own, but so far no further confirmation has emerged. 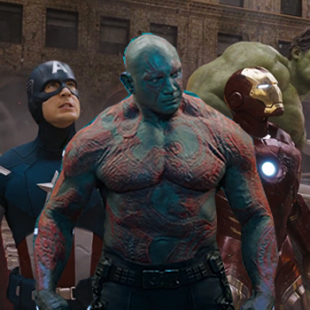 But, assuming it is true, and also that Vin wasn't just talking without knowing anything at all, a massive event of the sort hinted at by Vin Diesel and by today's Avengers 3 rumor seems tailor-made to bring together The Avengers, The Guardians and the Inhumans in a battle to save the universe from Thanos. Queue massive fangasms as far as the eye can see. The problem with this rumor is that Marvel is notoriously tightfisted when it comes to the MCU. The studio already had to shell out an enormous amount of money to secure Robert Downey, Jr. for Avengers 3, and that film marks the end of both his and Chris Evans' contracts. Securing Iron Man and Captain America for yet another film beyond that won't be remotely cheap. Tens of millions of dollars can quickly eat into a film's budget, even one as likely to get a big blank check as the third Avengers outing. There are also legal concerns. As Devin Faraci notes over on Badass Digest, Marvel couldn't just film one movie and then split it in two without first getting everyone signed on for the second film as a separate work. Sure, Marvel has already managed to put in place potential replacements for both RDJ and Chris Evans. Don Cheadle's James Rhodes could easily take over as Iron Man, while either Anthony Mackie (Falcon) and Sebastian Stan (Bucky/The Winter Soldier) could become a new Captain America. But first they have to write out RDJ and Chris Evans. It's difficult to imagine Marvel would squander the impact of the death/removal of its two flagship heroes, and the actors who played them, on a cliffhanger. Obviously, it's a safe bet that Marvel is building toward a massive crossover event, one that will probably include the Guardians, the Avengers and (maybe) the Inhumans. But given the realities of getting movies made, I'm firmly of the opinion that it'll be done in a single film, with the build up handled via stingers and plot points from the interconnected franchises. Of course, should this rumor begin to pop up on publications that have been around longer than July 20, 2014**, we might begin to take it more seriously. Until then, let's at least agree that true or not, this would, at least, be extremely cool. Yes, we've reached out to Marvel and Disney for comment, and we'll update this should any comment be given. In the meantime, even if (as is extremely likely) this rumor doesn't pan out, that shouldn't stop us from having fun with it. Readers, how would you go about bringing together the separate elements of the MCU for a megacrossover event? * Note how Marvel has started giving Inhuman ties to characters like Ms. Marvel who, a decade ago, would have likely had their fantastic powers explained as mutations. They're definitely thinking ahead to the MCU. ** I don't mean to malign Daily Marvelite, but the site's extreme recency means it doesn't have a reputation as a source for scoops. Respectful skepticism, is the point I'm bringing up.